Prioritizing exercise after a new baby doesn't have to be a challenge! If you’ve just had a baby, you may be ready to get back to your pre-pregnancy workout routine but now you have a few new challenges to face. For example, what will you do with your baby while you exercise? How will you find the time in your already busy schedule to make time to work out with kids? Will you have the energy after chasing said children? It might seem daunting as you adjust to a new schedule but it can absolutely be done. There is no right or wrong way since every family (and every mom and baby) is different. There are many different ways to exercise with your baby. You shouldn’t let having a baby make you feel like you are tied down or that you have to stop taking care of yourself. Something as simple as walking around the block with your baby in a stroller can be good for both of you. Take your baby to the gym with you. Many gyms have free or paid daycare service and you can just bring your baby along and let her play while you get your workout on. I went to the YMCA for a very long time and our full family membership that included both adults and as many kids as we had was under $100 per month and it included 2 hours per child per day. This also meant that you could hypothetically get more time at the gym by taking a child into the pool for thirty minutes at a time and thus extend how long you’re at the gym if you’re planning each child’s 2 hours accordingly. Work out at home to videos or online routines. You can leave your baby safely in their own environment and you can work out at your own pace. This also allows you the freedom to stop, pause, or start over as needed so you don’t feel pressure. And if you’re feeling even remotely insecure about how you look, it’s a great first step to build confidence! Include your baby in the work out. If your baby is old enough to hold his head up on his own, you might be able to incorporate your baby directly in the workout. There are exercises you can do like leg raises with your baby on board that let you spend quality time together while also getting your exercise. Even small walks around the block are great for both you and baby. Three of my kids were born in the winter and we did this even in really cold weather. My third in fact was born in the coldest months of Boston weather. So just bundle up if you have to and focus on a set path or a set time like 15-25 minutes and work up from there. A lot of towns have small studios where moms can come in and do short classes with their small babies and infants. They can range from dancing to yoga and beyond. It all just depends on what’s in your area! There are so many thing you can do while wearing your baby and every baby can be worn from day one! Early on, just walking or stretching can be a great way to get your body moving. But as time progresses take your baby on hikes or even find a dance studio that’s willing to let you wear your baby. The opportunities are nearly endless! I remember after my third was born, it was actually easier for me to focus on eating very clean than try to make it to the gym with so many little ones in those early months. So sometimes getting back in shape doesn’t even start with physical activity, but really focusing hard on eating as clean as possible even if you’re already eating well. Form a moms-of-babies exercise support group. Whether you find a stroller walking group, a moms’ yoga class or other, you can group up with other moms! 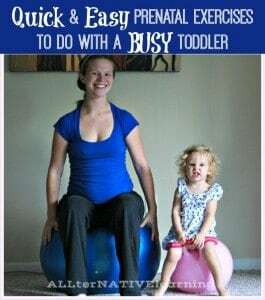 But you can also find other new mothers with babies who also want to work out and take turns helping one another instead of doing it all together. Either way you get accountability in the process as well. You can form teams to babysit while the others work out together, or you can pick one to watch the babies while the others go out and then rotate. You could also do exercises with your babies together, if all the babies are old enough. It can be a lot of fun with friends and will help keep you motivated. Especially if you can find a great infant swim instructor, this can be a way both mom and baby can get some physical activity. The baby can learn survival skills and mom can have a low-impact way to get her body moving. Your baby doesn’t have to stop you from getting the exercise you need. It can even be a great way to bond together.